Caithness in the far north of Scotland might not be the first place that springs to mind for a company manufacturing very high quality kitchens which compete head-on with imported German products, but the fact is that Ashley Ann, based in Wick, is doing just that. Indeed, such is the scale of the operation that the company is now the largest private employer in the county. Having been established more than 30 years ago by husband and wife team Stephen and Ellen Bremner, Ashley Ann now manufactures around 3600 kitchens per year. Its markets are its own 8 showrooms in Scotland, 105 dealerships it supplies across the UK but mainly in England, plus a contracts division which supplies higher-end house builders across Scotland. Turnover for the last financial year was an impressive £16.8m. 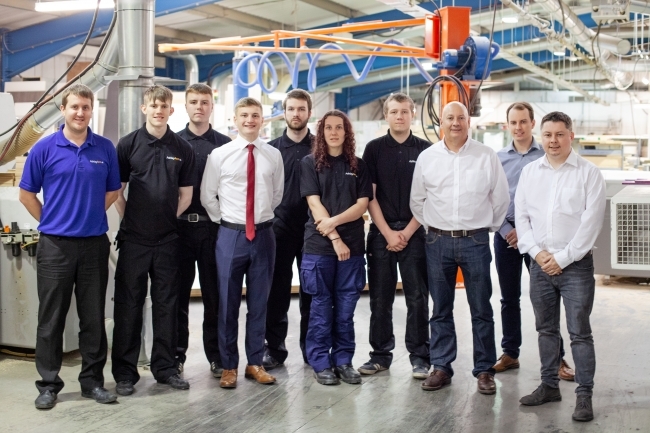 The company has recently won Best Family Business in the Highland Business Awards, and is taking on a further 5 apprentices at its Wick head office and manufacturing facility – where it already employs around 150 people. The position in the kitchen market which Ashely Ann occupies is very much dominated by German manufacturers. Indeed, a German kitchen has become synonymous with quality to many consumers in the same way a German car has. However, Ashley Ann has been able to more than match this level of quality, with a key differentiator being a level of flexibility for bespoke product which the Germans simply can’t offer. This has been especially appealing to dealerships in affluent areas of England, as such a custom service is something which ensures their own customers end up with exactly the kitchen they want. Business founder and owner Stephen Bremner said: “Throughout the markets we operate in, we’ve been able to demonstrate that our product quality is every bit as good as that from the leading German manufacturers, but with us there’s the option for truly bespoke products – which the Germans just can’t cater for. In addition, our lead times are typically less and, given the level of quality, our prices are very competitive. Although we’ve seen reasonable growth in recent years across the whole business, in our dealership market, and especially those located in SE England, the growth has been excellent and now represents around 35% of our turnover”.